On November 3, 2017, I released the latest Arca short story, Pie. It’s approximately 11,750 words long and takes a little more serious tone than most of the rest of the series. 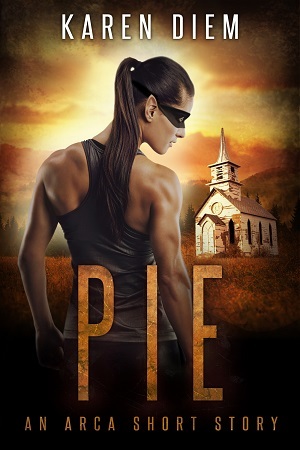 While it occurs following the events of Power (currently scheduled to release May 2018), Pie does not include any spoilers for the novel, though it does reference events occurring in both Super and Human. As usual, Zita is a fan of immoderate language, so some cursing is included, free of charge. Zita Garcia is a superhero with a plan. While on a multi-day road trip to their mother’s home, she’d bring up her brother Quentin’s recent bad behavior, he’d see reason, and everyone would be happy in time for Thanksgiving. Since neither one of them wants to incur their mother’s wrath, he can’t kick her out of the car and she can’t do any spinning drop kicks when he annoys her. Of course, Zita isn’t known for her diplomacy, so her plan began unraveling even before the teary teenager and the rampaging pink monster showed up. Good thing she’s got all her wits, and some pie. Or at least the pie. This free short story is only available to newsletter subscribers, both new and existing. Anyone who joins the newsletter will also receive links to Tourists and Washout, as well as any future freebies, sneak peeks, etc.